There are a ton of smartphone cases out there, and a lot of them are high-quality, well-made cases. But it’s even more rare to find a high-quality, well-made case that’s made 100% in the USA. You need look no further than Carved. Hailing from Elkhart, Indiana, Carved is a small company making big products. Thanks to them for sending me a custom case for my iPhone 5. 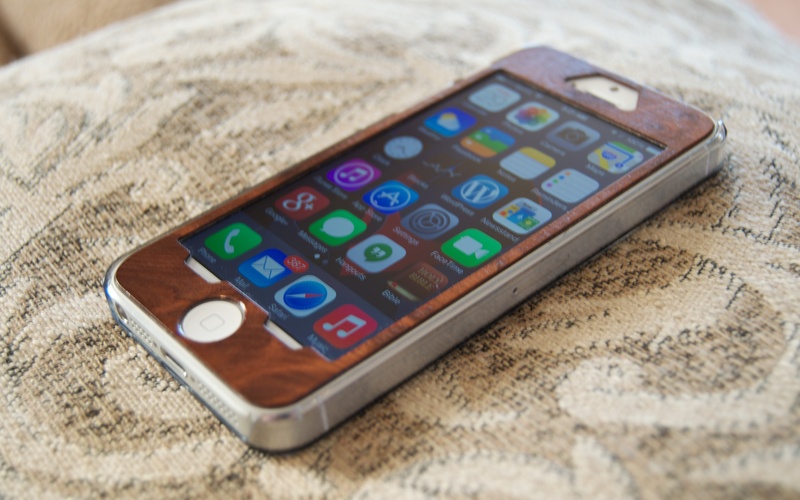 Carved makes handmade wood cases for the iPhone, iPod and Samsung Galaxy S3 and S4. You can choose from a variety of woods like Cedar, Ebony, Bamboo and my choice, Redwood Burl. The woods are absolutely stunning and beautiful. Word of warning, however, don’t expect an exact match from what you see on your computer as wood can change from piece to piece. You may see one pattern on your computer and end up with a different pattern or even a deeper or lighter color. Of course, this is perfectly understandable as this is real wood, no printing here, you get what nature dishes out. Carved is all about being a part of nature. I got my case very quickly and it came in simple, yet attractive, packaging. Keeping with the wood and nature feel the packing looks to be made of recyclable paper and has a rustic and (dare I say) woodsy feel to it. Unpacking the case you have some Carved literature and a Carved sticker and of course the case itself. Pulling the case out of the packaging it is of course super light. The sides are made of hard plastic and the back is all wood. Included with my case was the front skin (also made of Redwood Burl) which goes over the front of the phone and adds protection to the front of the device. One of the first things you notice about the Carved case is the texture and feel of the wood. As a guitar player, I love woods and the feel of woods, so I liken this experience to feeling a Taylor or Martin guitar. Along with the texture and feel of the wood there is the smell. While this is not a whole lot of wood, if you put your nose up to it you can smell the wood and I love that smell. After taking in the texture and smell of the case I turned it over and noticed a nice little touch on the inside of the case. It appears the Carved team signed the inside of the case, which I thought was a great touch. First I cleaned the front of the phone and started in on installation of the front skin. Installation was very easy though I will give you this advice. Get a razor blade to help lift the paper covering the back to expose the adhesive. It’s very difficult to get off with fat fingers and no nails, so it’s advised you save yourself headaches and find something thin and sharp to help lift a corner. After installing the front skin I noticed it has a slight rise to it and that slight rise helps protect the phones screen. The front skin costs a little extra but it’s well worth it if you feel the need to protect the front of the device. Some people may not like the aesthetic look of it so it will be a personal preference. After installation of the front skin I waited about 30 minutes just to give that adhesive some time to set. Installing the case was as simple as any other case, just slip it on and it’s done. The case is amazingly beautiful and people will definitely notice it. Carved also offers custom engraving on their cases. Mine came engraved with TECHAERIS on it along with an eagle. There is a online skin designer they provide for you to make your own case and pre made ones as well. The custom engraving is what really makes this case personal. For the cost involved you really are getting a one of a kind at a great price. So how does it protect? Of course it’s a case and we need to touch on that. I feel Carved cases offer great protection and you should feel confident that your device is safe, especially with the front skin on. The corners are well protected with plastic and I feel your device will survive a good tumble. If you’re looking for Ballistic or Otterbox type protection then turn around because this is not that. Carved offers great protection combined with simple design and beauty of nature. And the best part is it’s all made and designed in the USA. I give Carved a solid 5 stars for their cases. I highly recommend you check them out at the link below.